7 September 2015: The University of Canberra (UC) and the Australian National University (ANU) have joined forces in a unique collaboration to help students kick-start their careers in science teaching. For the first time, starting from 2016, the two universities will offer a vertical double degree for science teaching, combining a Bachelor of Science (BSc) from ANU with a Master of Teaching (MTeach) from UC. 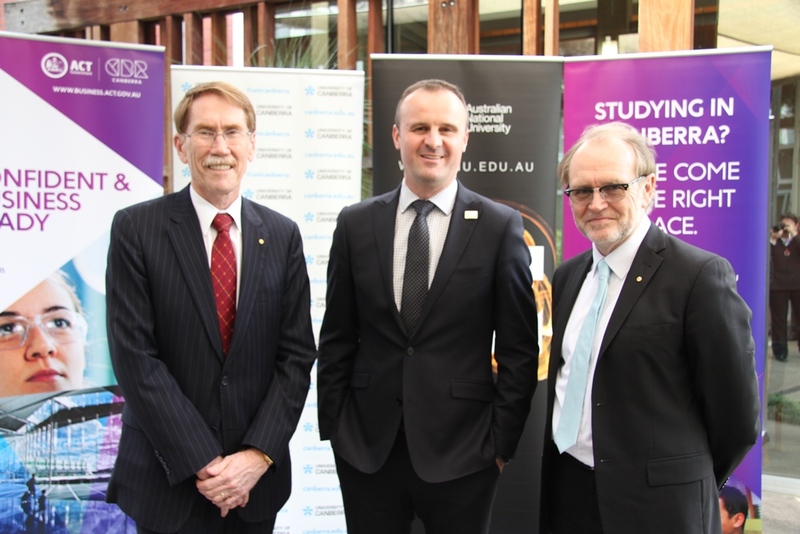 The new double degree, launched by ACT Chief Minister Andrew Barr MLA today, will make it possible for final year BSc students to also study for the MTeach, with final-year classes credited for both awards. "This collaboration is a wonderful partnership between two leading universities and will help Australia address the growing need for more science teachers as the economy continues to modernise," Mr Barr said. "The combined ANU-UC course will allow students to gain their science and teaching qualifications six months earlier than it would take to do the courses separately. "The ACT Government recognises the value of ANU and UC who attract top class students to Canberra and play a leading role in the $2.5 billion per annum the higher education sector contributes to the ACT economy." ANU Vice-Chancellor Professor Ian Young AO and UC Vice-Chancellor Professor Stephen Parker AO said the new double degree flipped the process of teacher education by allowing students to specialise in science first, and then develop their teaching skills. Professor Young said the new vertical double degree would help improve careers and standards for teachers in the crucial areas of science, technology, engineering and maths (STEM). "This new vertical double degree will give students a new pathway into science teaching by giving them access to outstanding qualifications in two specialist areas in a shorter time, and at a lower cost," Professor Young said. Professor Parker said the collaboration between the two universities would allow greater choice for students wanting to study science and teaching together. "This unique collaboration will give students the best experience of both universities, by providing them with access to Australia's best science and teaching-education facilities," Professor Parker said. He said the intensive practical component of the combined degree will ensure students are well prepared to meet the rapidly changing demands of the job market. The combined BSc MTeach will also open up more scholarship opportunities, with industry already spending money to offer scholarships to promote careers in STEM. A PwC report in April this year underlined the importance of teaching STEM subjects, finding 75 per cent of the fastest growing occupations now require STEM skills.